What an exciting month! 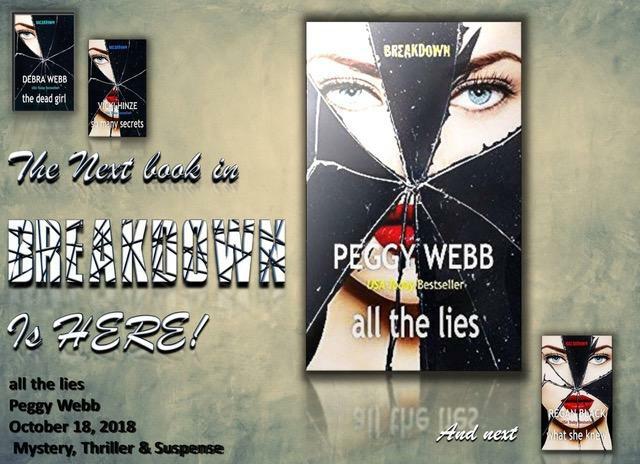 BREAKDOWN, the four-book suspense series I wrote with Debra Webb, Vicki Hinze and Regan Black launched the first Thursday in October with Deb’s book, the dead girl. The following Thursday, Vic’s book, so many secrets, hit the bookshelves. This Thursday, October 18, my book, all the lies, will be available as an eBook and in paperback at Amazon. Each of the four BREAKDOWN authors also wrote prequel short stories that are available on Amazon. If you sign up for my newsletter, you’ll get a free copy of my prequel. Also, visit my Facebook page this week (Oct. 14-19) and enter the Share to Win Contest. (Just click on the FB link at the bottom of the page.) Two winners will each receive a BREAKDOWN tee shirt and a BREAKDOWN mug. The second winner will also receive a few surprise gifts. Join the fun and share all my BREAKDOWN posts at FB this week to win! Thank you for your loyalty and the outpouring of support for my books. You’re the best.